I am not that familiar with Huda Beauty makeup. Not that many of the releases I see excite me or make me want to get into the brand. It is quite a high end brand, which also means that items can be quite pricey. 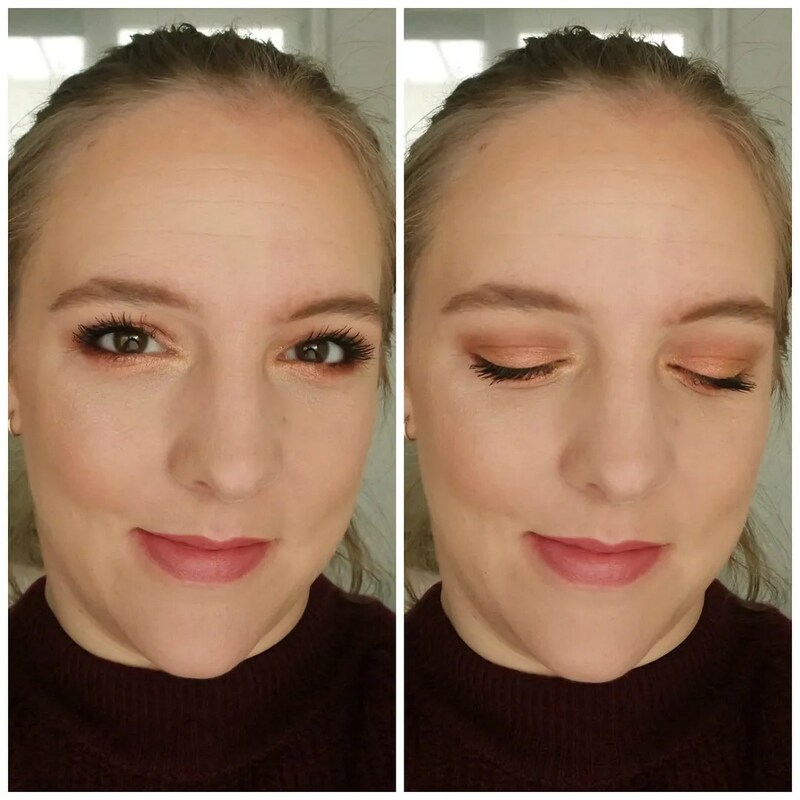 When I spotted the Desert Dusk eyeshadow palette, I knew I had to try and get my hands on it. I bought my palette via Cultbeauty, which is great as they do free international shipping. This palette retails for $65, which is quite steep. This makes it one of the most expensive palettes I currently own. Inside there are 18 shades that should represent the colors of a desert at sunset. I chose this over the original Rose Gold Textured palette, as I wasn’t too keen on the textured shadows in that palette. This only has one pressed glitter, so I thought I might enjoy the other shadows at least. Desert Dusk comes in a beautiful outer box that is all purple. 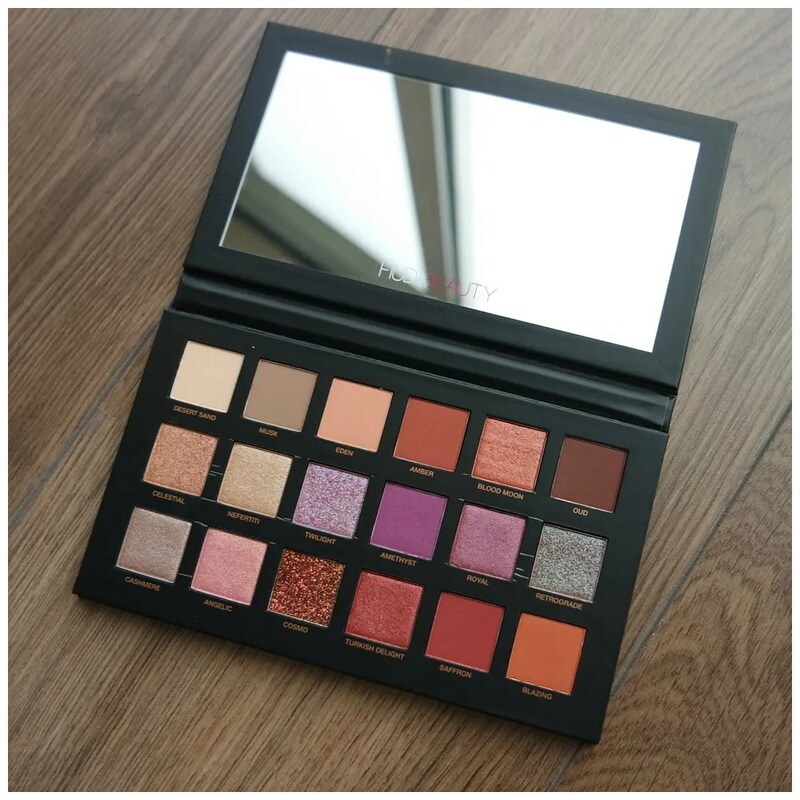 When you slide the palette out of the box, you are met with a palette with Huda’s face on it. The shimmer on the eyes also truly reflects in the light. In the lid there is a good sized mirror and this palette is made out of cardboard, but does have a magnetic closure to make sure the palette is stays shut. The palette contains a lot of warm tones and a few pops of purple. This was one of the first palettes to come out with such a color scheme and now purple seems to be put into every palette it seems. You get 8 mattes, 7 shimmers, 2 duo chromes and 1 pressed glitter. I could have done without the pressed glitter and would have preferred that to be a duochrome as well, but overall, I like the color scheme. The palette doesn’t run super deep, but the lightest shade is a bit too dark for my skin tone, which is a bit of a shame. 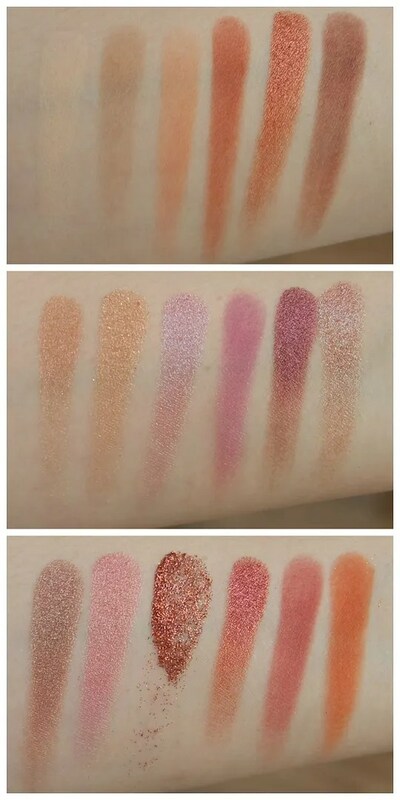 Here you can see the shadows all swatched per row. As you can see these go on well with a finger swatch. The mattes feel a bit dry to the touch and do not show up as pigmented as they are. They performed much better on the eyes than they did in the swatch. All of these shades worked amazingly well. They went on easily and smoothly. Blending was an absolute dream with these shadows. The shimmers is where this palette truly shines. This palette has some amazing shimmer shades. Cashmere on the bottom left is a stunning shade, but all the other shimmers are not only amazingly smooth, but they also go on well with a brush and stay put and look intense all day. The glitter, while not my favorite, stayed put well over a bit of glitter glue. For my first attempt at using this palette, I decided to keep things simple. I went in with all the basic shades this palette has to offer. As you can see, it is super easy to create a neutral day time look. I say neutral, but I feel this palette does step it up a notch. While very wearable still, I do feel that Angelic is a shade that definitely amps up the look and takes it to the next level. That is why it is one of my favorite shades in this palette. You knew I had to play around with those purples right? 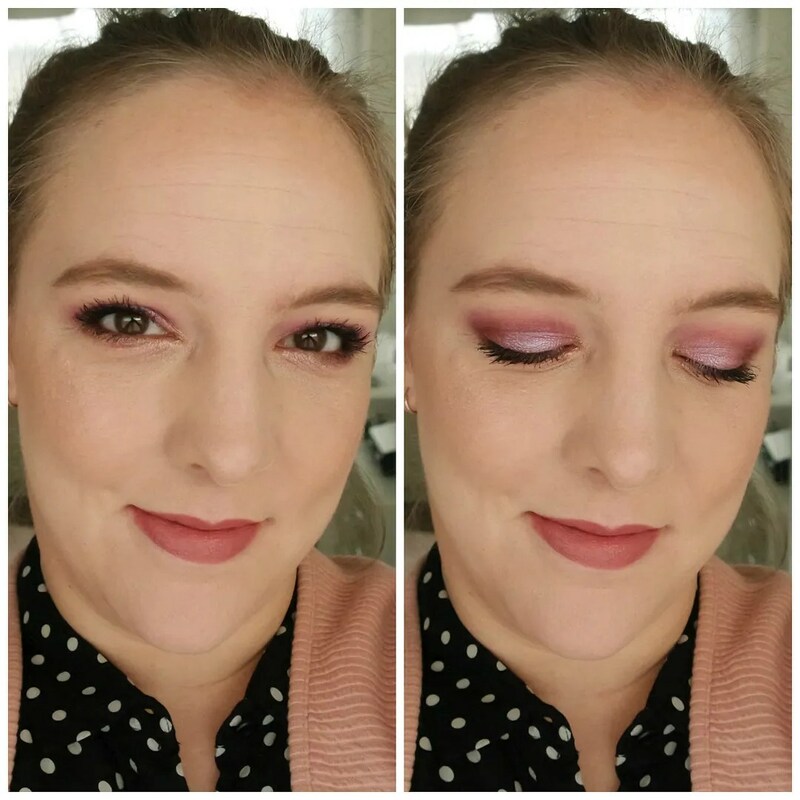 Even though this palette only boasts 2 purple shade and one duochrome, I feel it is very easy to create a look that is all purple with this palette. Another time I used this palette, I paired some of the purples with the warm tones in the bottom row of the palette and that made for a surprisingly cool look as well. So this palette is a lot more versatile than it may seem. 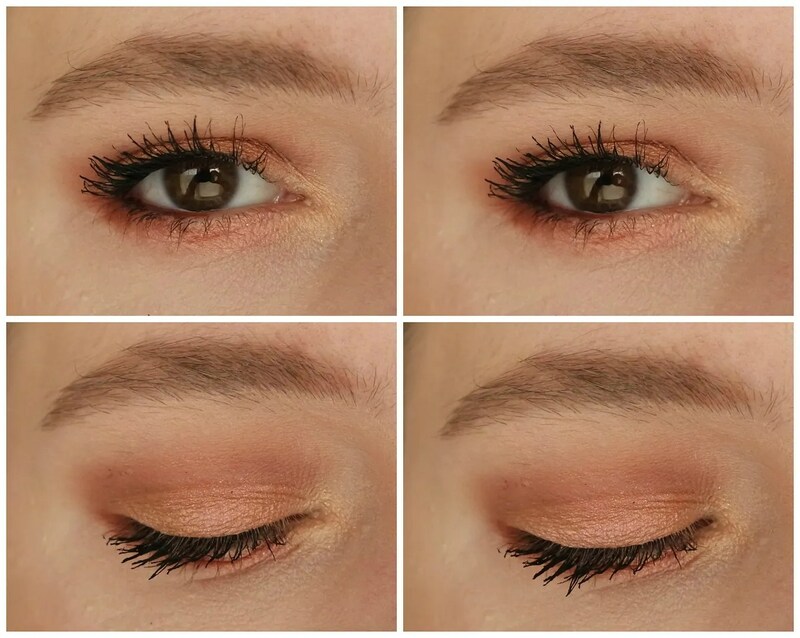 For look number 2, I decided to go all about with those gorgeous warm tones. 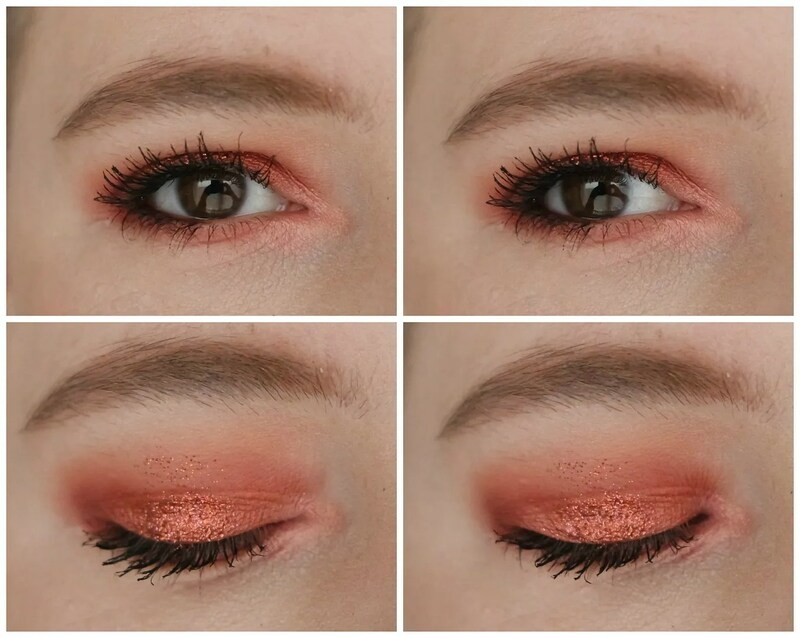 And for someone not so keen on warm toned eyeshadow, I have to admit I really like this look. I was surprised by how well Cosmo wore throughout the day. 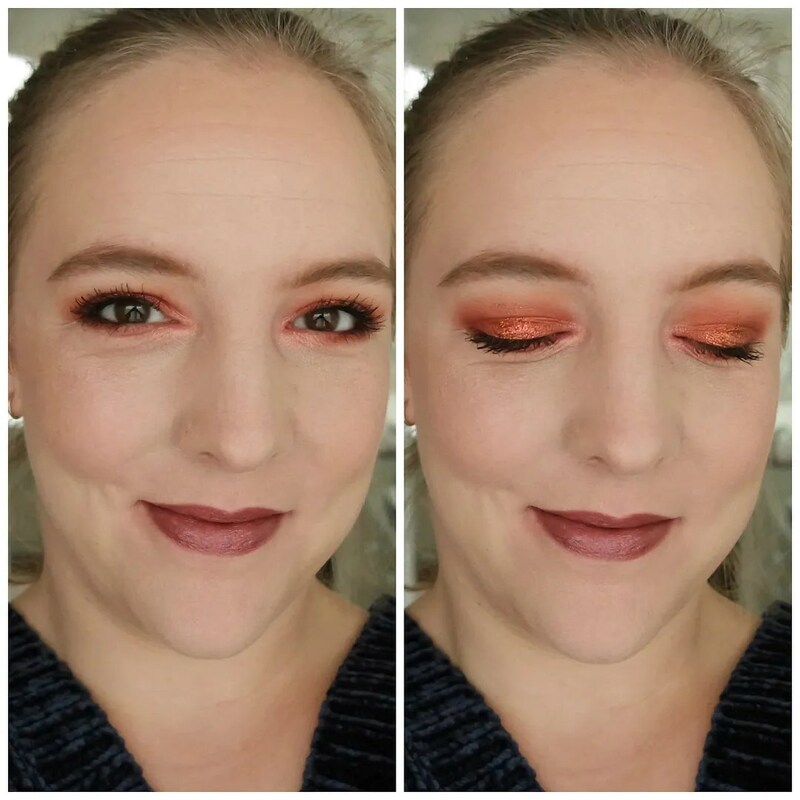 I mixed Saffron and Blazing together to create a stunning crease shade that goes well with this look. Blood Moon and Turkish Delight are both two other standout shades in this palette. 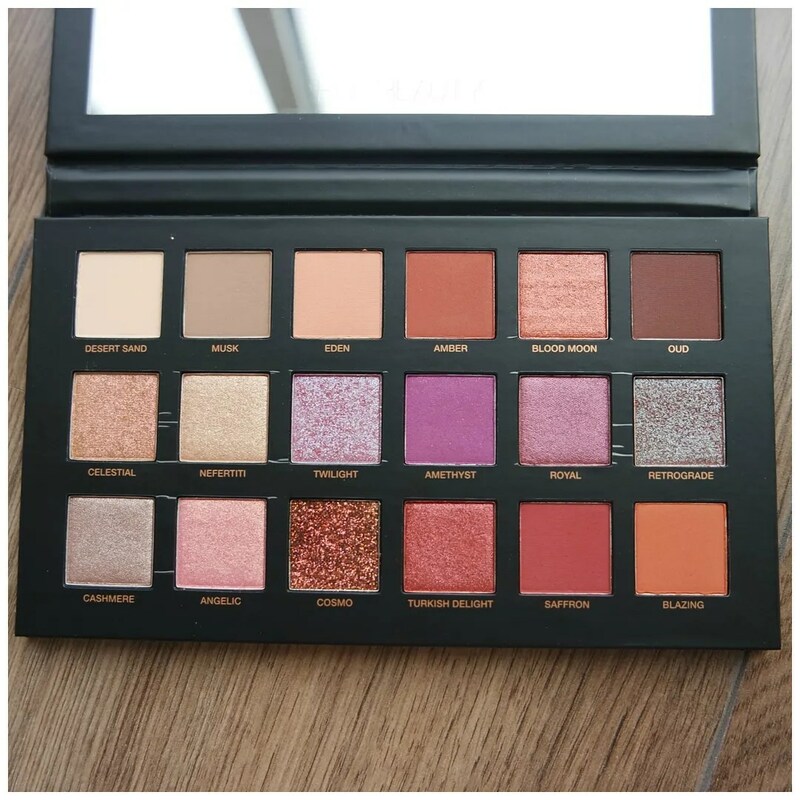 Yes, I love the Huda Beauty Desert Dusk eyeshadow palette. This is one of the best eyeshadow formulas I have every tried. It is not too powdery, the shades blend well and the color scheme is as unique as it is gorgeous. Definitely worth the splurge! 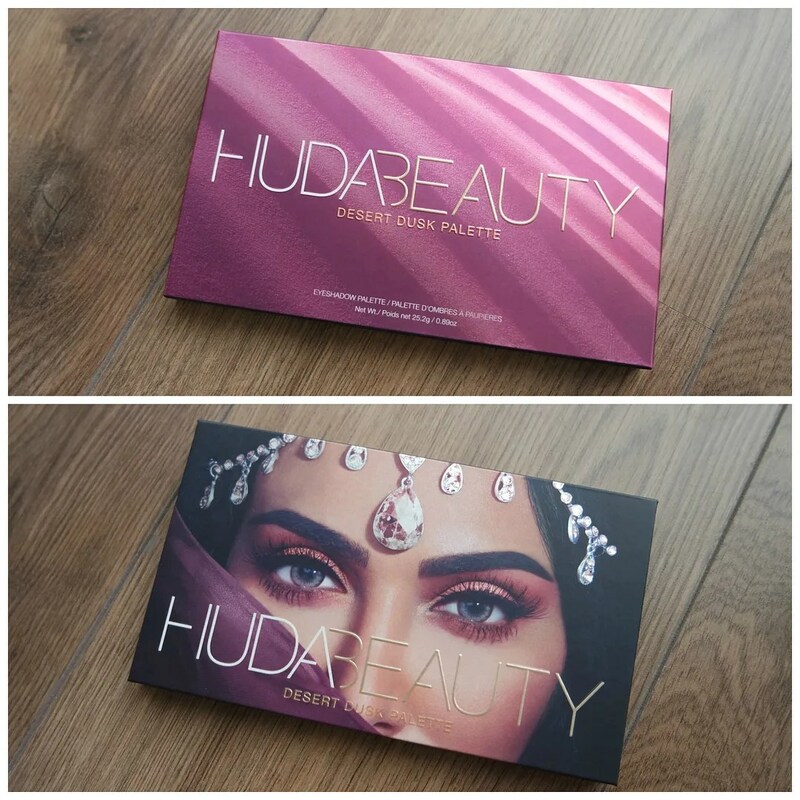 Have you tried anything by Huda Beauty? Thanks for your comment. I would love to try the new obsession palettes. The green and blue look stunning. It is a very pretty pallete yes.